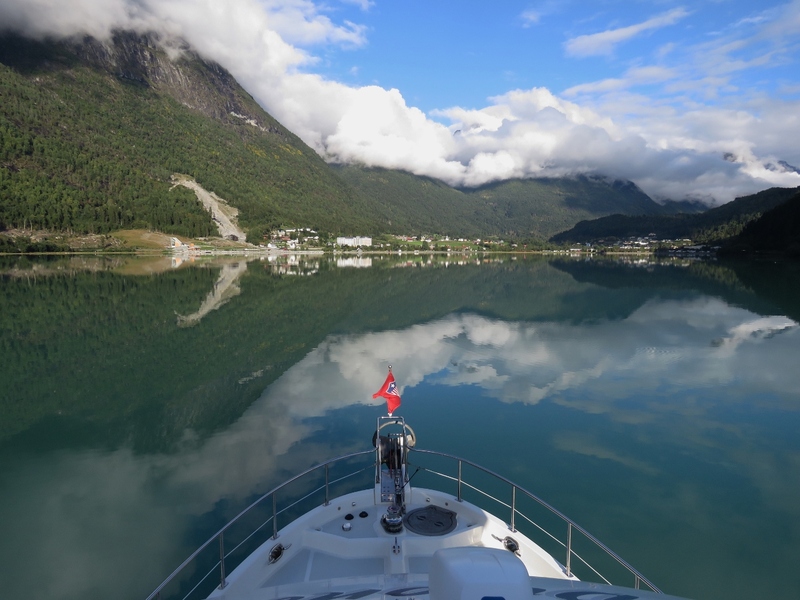 We re-rounded the infamous Stad on our continued southbound return trip along the Norwegian west coast, travelling 135 miles fjord-to-fjord from Hjorundfjord to Nordfjorden. Conditions at Stad weren’t quite as settled as on our northbound leg, but we had an easy run around. The winds fell as we ran up Nordfjorden, with spectacular scenery reflecting in still waters as we neared the head. 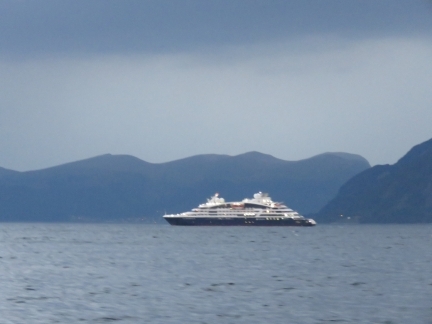 The luxury cruise ship Le Champlain, that we’d seen in the shipyard before departing for Alesund, was out on sea trails just past 6am this morning. 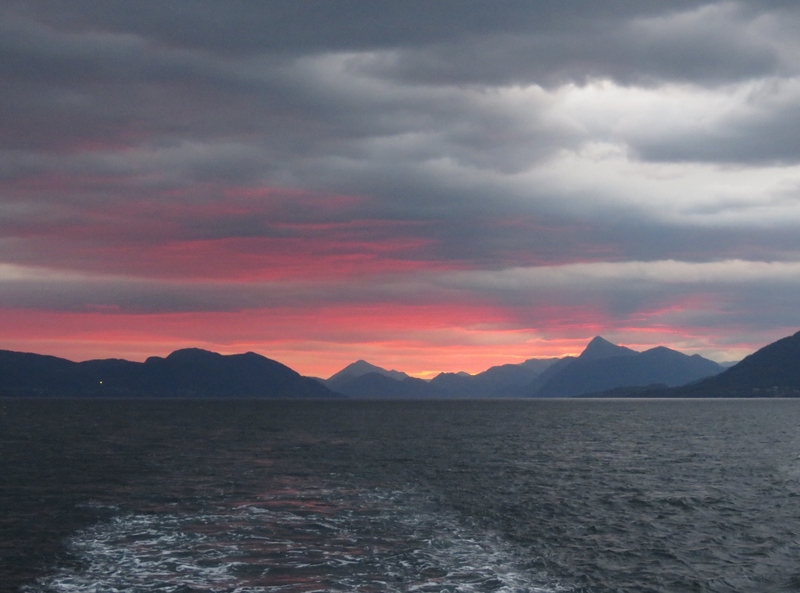 A beautiful pink sunrise behind us at 6:30am. 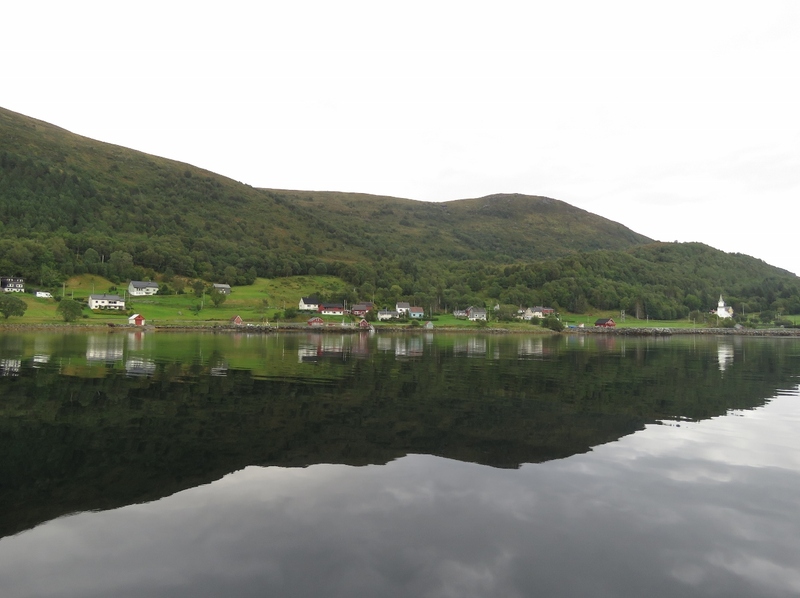 Calm conditions off the village of Gursken where we’re anchored for the night before rounding Stad tomorrow. It’s hard believe the winds are blowing over 20 knots off Stad right now, but we saw winds that high as we ran north through Hallefjorden before turning south toward the anchorage. 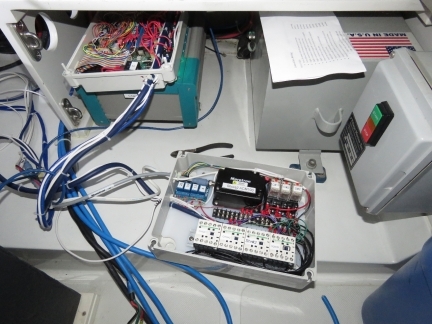 This control box is responsible for a wide variety of tasks including: 1) supporting a second up to 16A shore power connection with electrical interlocks making it easy to run the boat on shore power connections as low as 8A by using two of them and 2) load-shedding the dual 100A chargers when power consumption on the boat exceeds the load capacity of the supply (shore or generator). 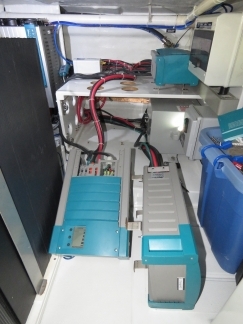 For future use the control box also implements: 3) support for a 4×20 character LCD panel, 4) support for a 4×4 matrix keyboard, 5) 1 channel of digital input, and 6) 8 channels of digital output. The load-shedding functionality will replace the current system where wecontrol the chargers via the proprietary Masterbus interface through a CANbus adapter. We are replacing it because the CANbus adapter has occasional device driver issues where Windows mistakenly treats the OS driver as a mouse driver. This isn’t hard to resolve, but is annoying. We now instead have a pair of rock-solid Schneider relays to control the chargers. In order to control the chargers via the dual 16A control box, we need to insert the control box between the chargers and their power feed. This isn’t hard, but it means that everything needs to come out to give charger access. 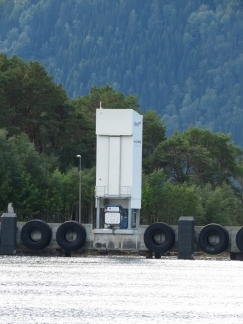 The control box also will be used to support the second up-to-16A shore power connection. 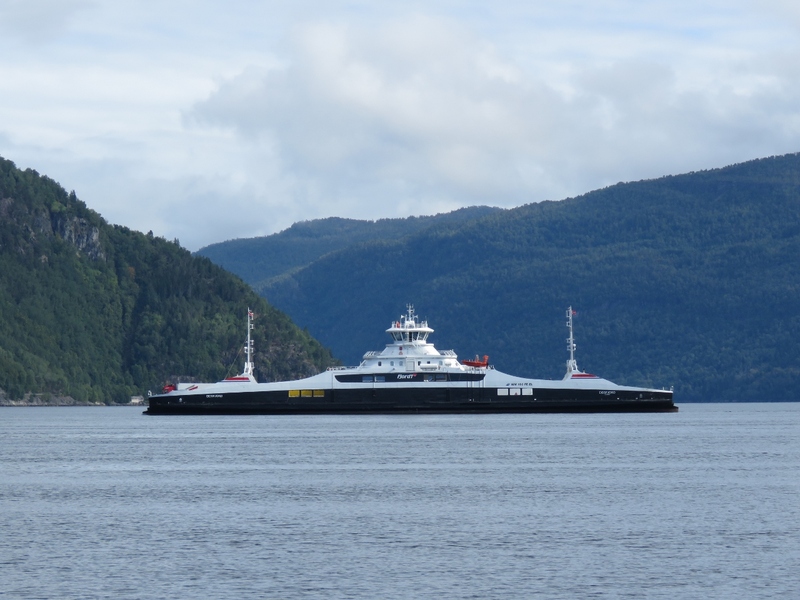 This will allow us to run on the dual 8A or 10A power often found in smaller centers in Norway and specficially allows us to run on dual 16A connections when at Amsterdam City Marina which doesn’t have 32A power connections. We departed the anchorage at 4am and are just nearing Stad at 6am. 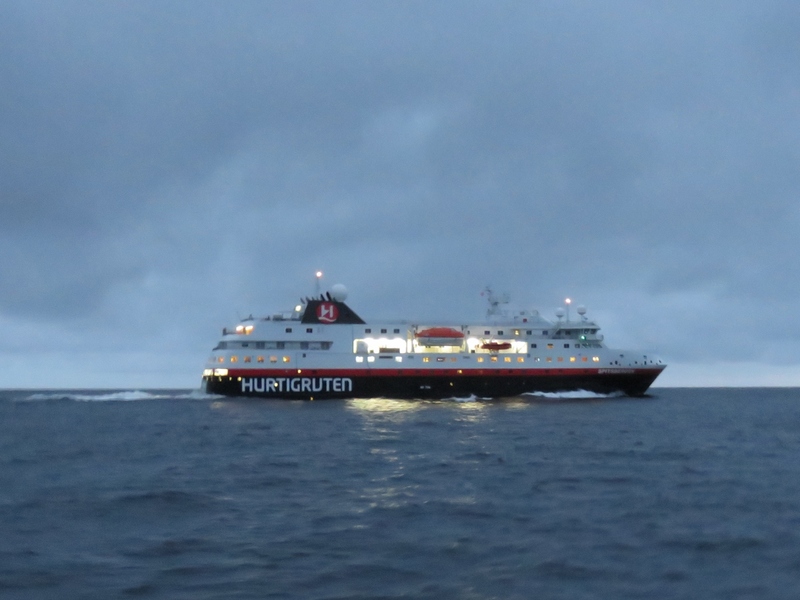 We’re starting to pick up a bit of boat motion with a gentle westerly swell. Conditions are ideal for rounding Stad with with less than 15 knots of wind behind us and similar forecast for the next few hours. The winds will pick up around noon, but we’ll be well around by then. Even though we have good conditions for rounding Stad, we are somewhat apprehensive as this is considered a dangerous area; so dangerous that funds have been approved to build a ship-sized tunnel through the headland. 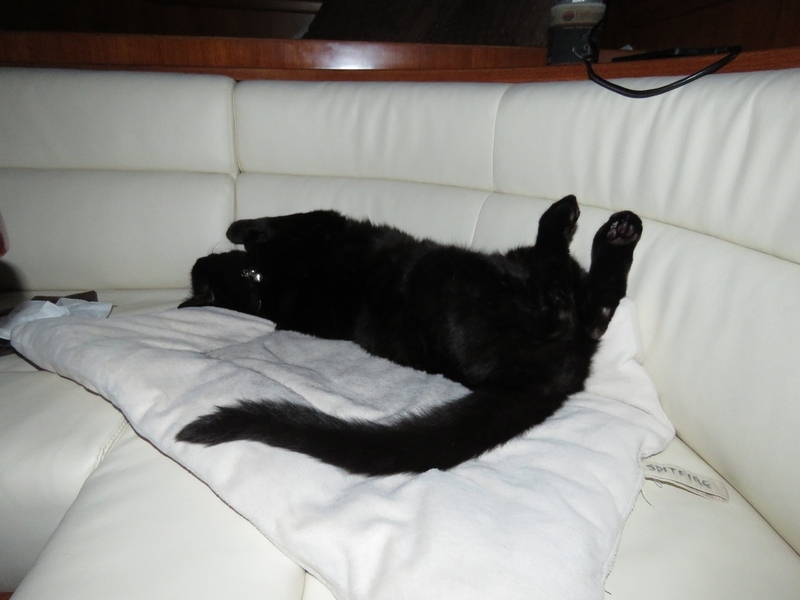 Spitfire, however, has no worries at all as we approach Stad. 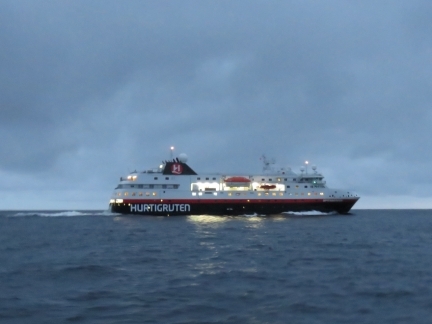 Passing the Hurtigruten Spitsbergen as we round West Cape on the tip of Stad. 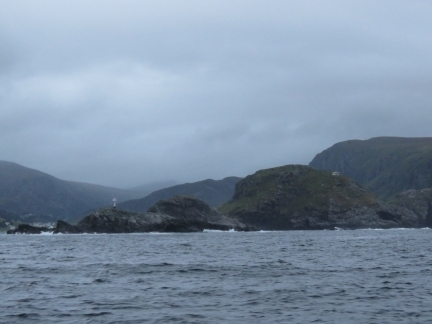 The Buholmen light on the bleak, exposed Stad coast just south of West Cape. 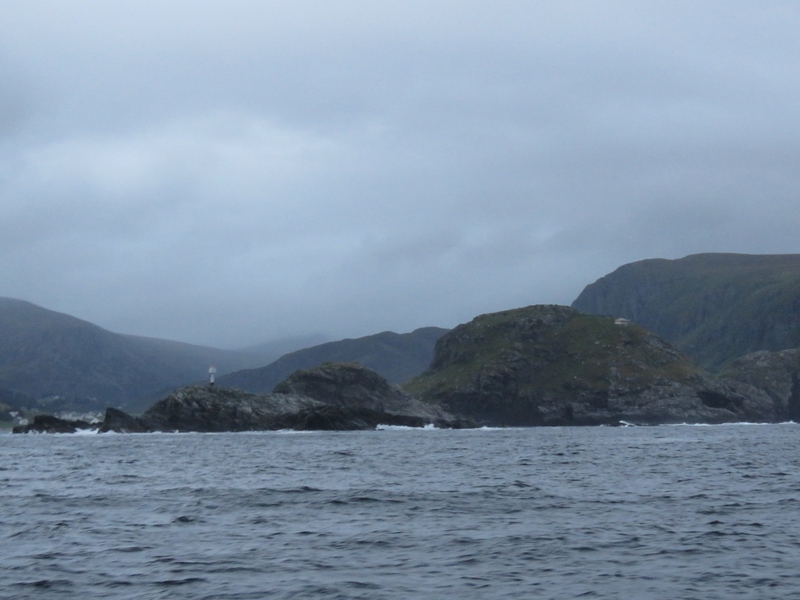 The pitch and roll graphs at the center of the display (click image for a larger view) show pitch picking up about two hours ago as we got into the westerly swell off Stad. 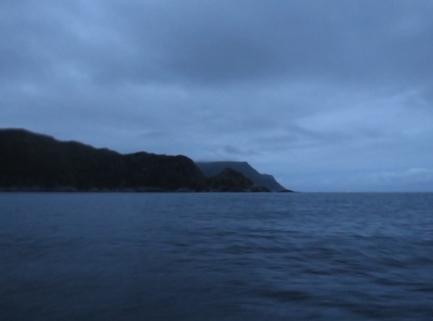 Then as we turned to run southward, pitch diminished and roll picked up as we took the swell more on the beam. Neither motion was particularly troublesome, as the swell period was large and the degree of pitch and roll was only around five. 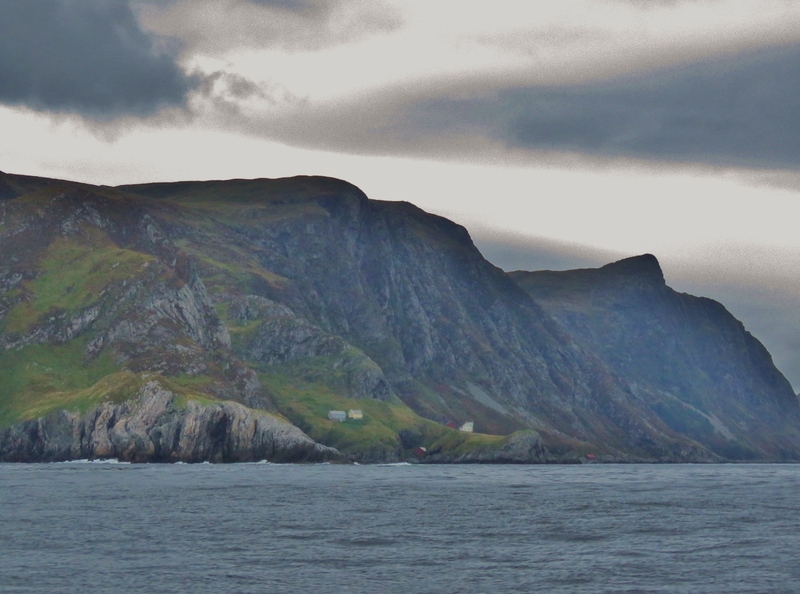 Steep cliffs along the rugged south coast of Stad as we round Furuneset at the southern tip of the headland. The well-equipped Baatbygg Shipyard just north of Maløy has a dry dock that can handle ships up to 485 ft (148 m) long, a 4,000-ton slipway and a 95-ft-wide (29 m) by 91-ft-tall (21m) hall with a 50-ton crane. 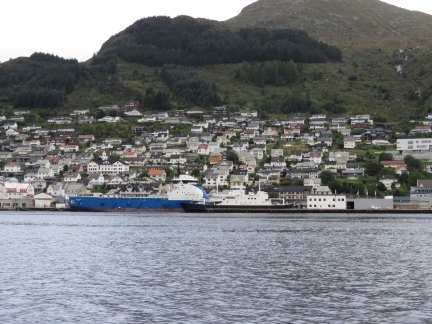 The 273-ft (83m) offshore supply vessel Nao Fighter docked at Maløy with the ferry Sognefjord in the foreground. 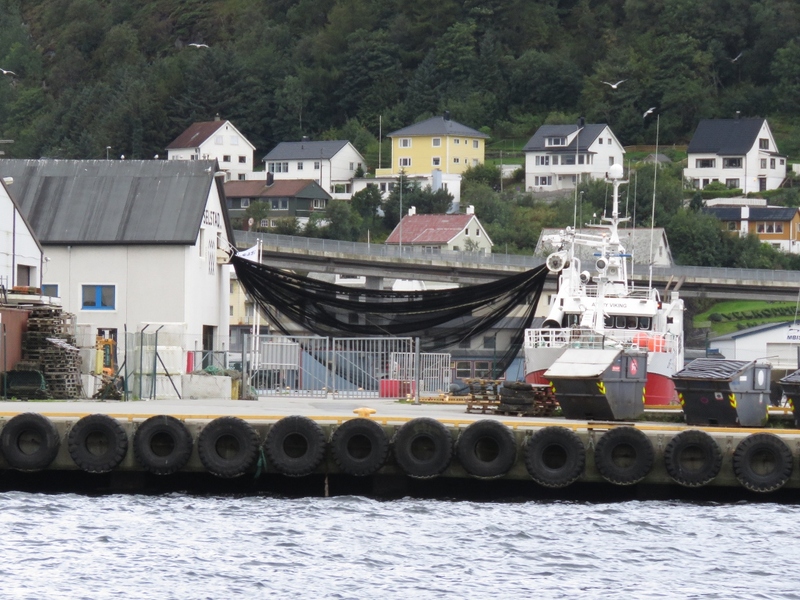 The fishing vessel Atløy Viking transferring a net between ship and shore at Maløy. 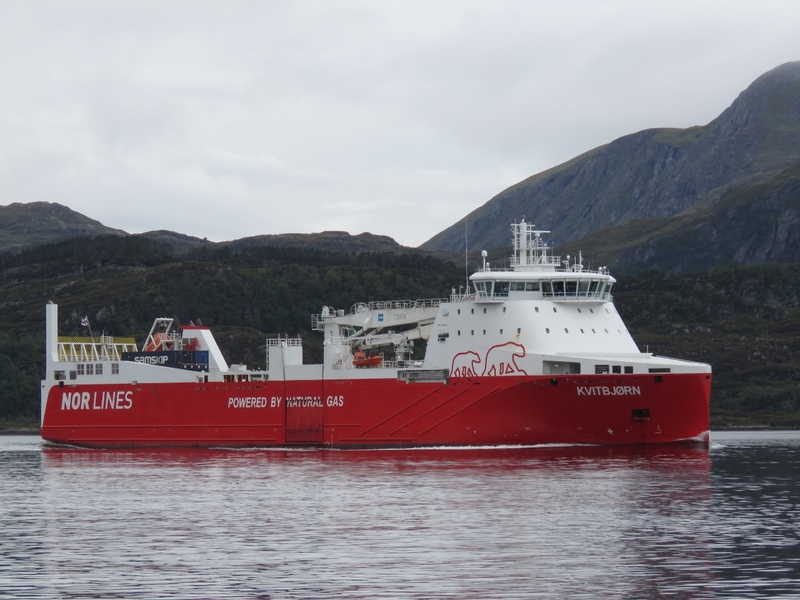 The LNG-powered cargo vessel Kvitbjørn (translated as “White Bear”) that we saw in mid-May near Trondheim. 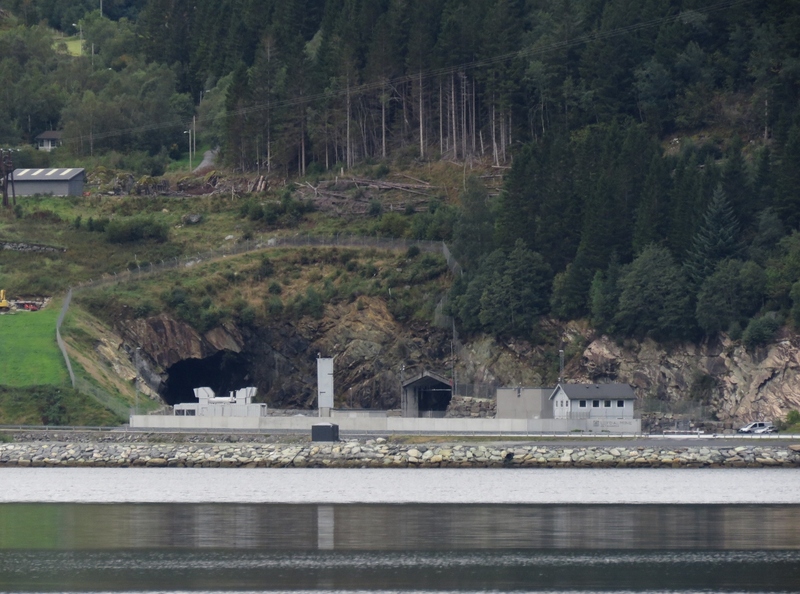 As we ran up Nordforden we noticed what appeared to be a mine on the north shore with a surprisingly large amount of security. It was the Lefdal Mine Datacenter, a former mine that has been converted into a datacenter. That would be a fun tour to take. Low clouds and calm waters at the village of Davik where we’re anchored for the night. 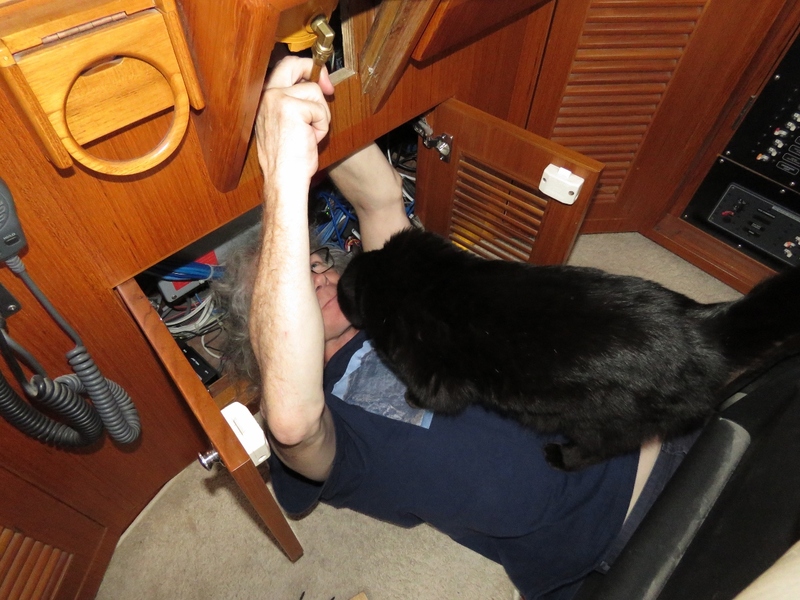 James investigating a steering pump noise with Spitfire supervising. 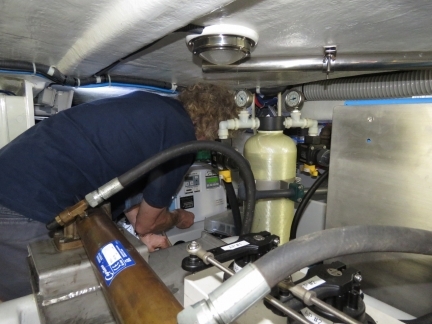 The new steering pump produces slightly higher pressure and generates a vibration in the pipes at the helm. 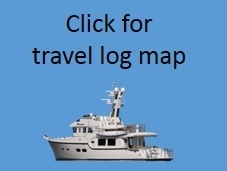 Some padding around the vibration points drastically reduced the noise. We initially were planning to run all the way to Loen at the head of Nordfjorden, but we stopped in Davik to investigate a problem with the watermaker that we wanted to have time to address before continuing on. 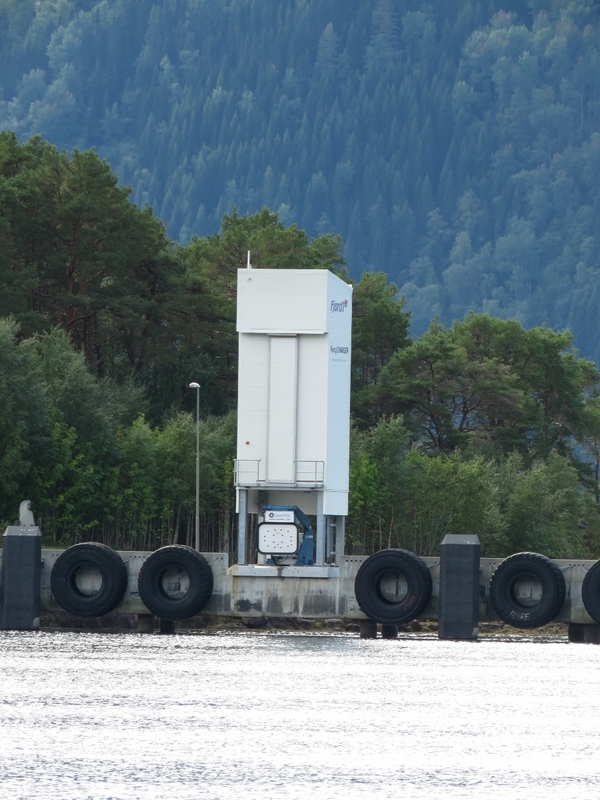 We’d not used the watermaker for two months, since before arriving into Trondheim and it was making water, but discharging it overboard. 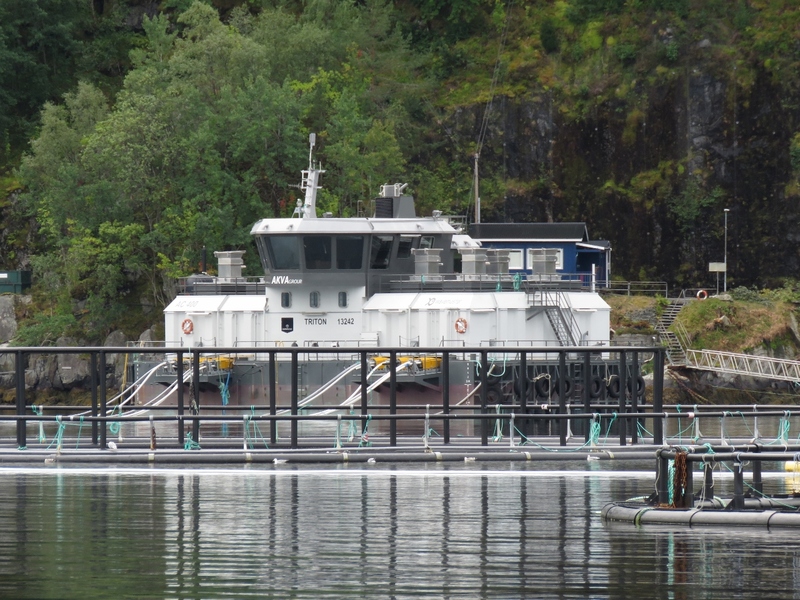 We suspected the dump valve was stuck open, but it turned out to be a super-easy problem to resolve. While replacing the steering pump in Trondheim, we must have accidentally closed the media filter valves. Opening it fixed the issue and we’re operational again. Since it was still relatively early in the afternoon we decided to continue on to Loen. 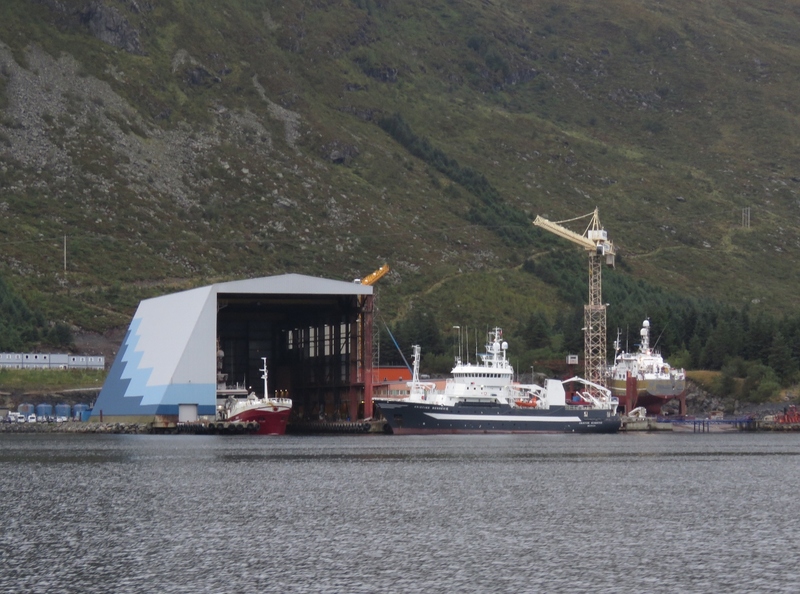 Most of the Norwegian fish farms we’ve seen have these control-tower type work buildings that resemble ships from a distance. The modern-looking ferry Eidsjford was built in 2017 and is battery electric, part of Norway’s goal of zero-emission ferry operations. 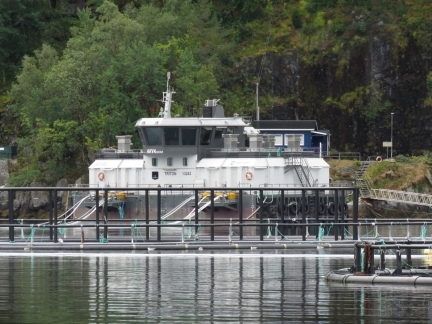 The plug-in for battery electric Eidsjford and sister-ship Gloppefjord. The bluff Ulvedalsneset reflected in still waters as we near the head of Nordfjorden. 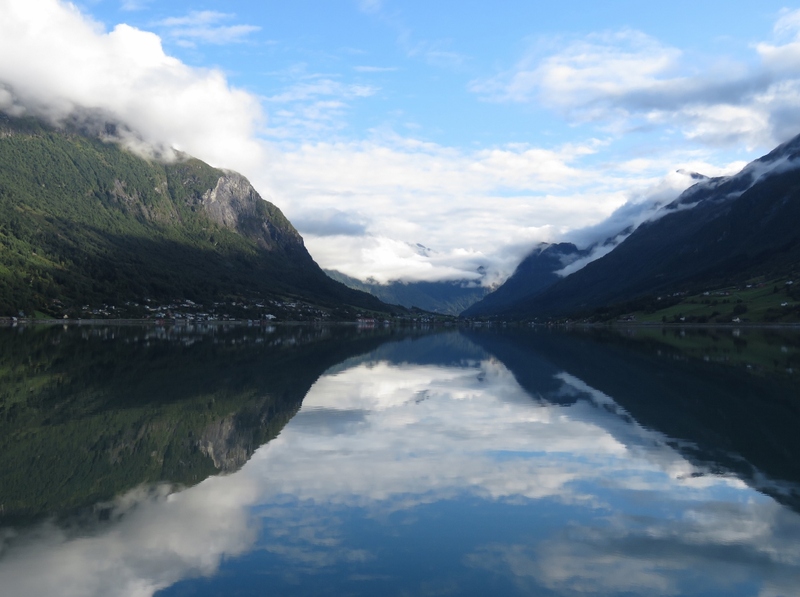 The view to Loen and the spectacular Lodalen valley beyond at the head of Nordfjorden. 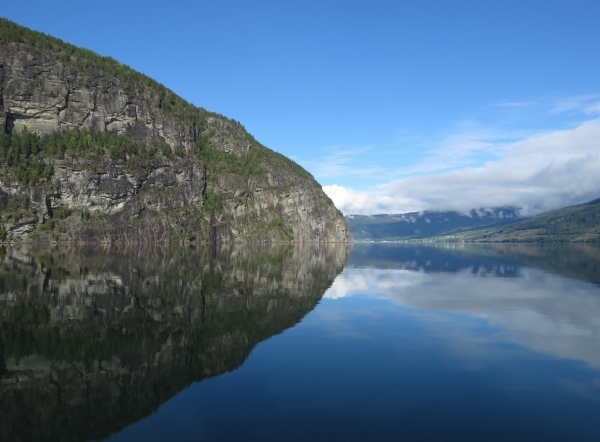 Wonderfully calm conditions as we approach the anchorage off Loen. 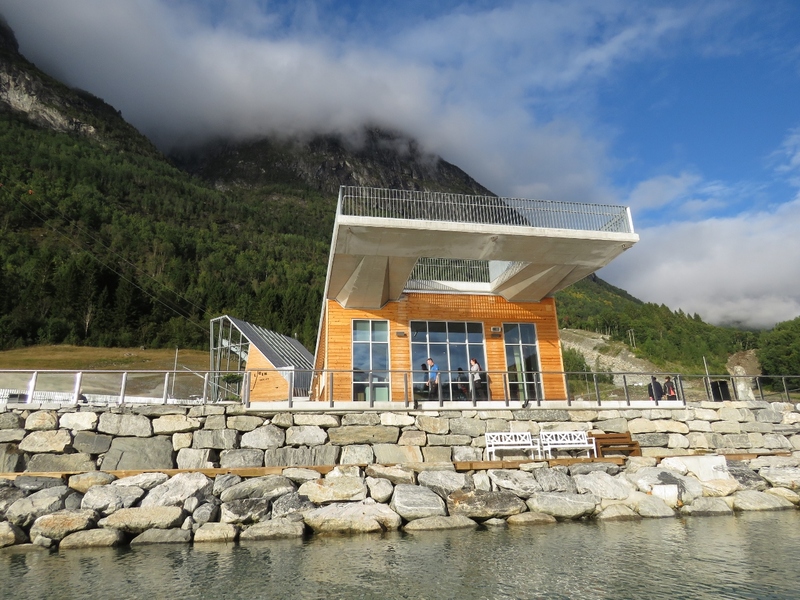 The modern Loen Skylift visitor center. 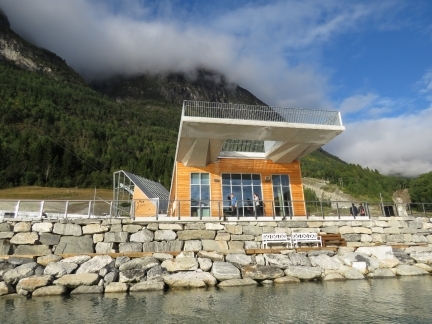 The cable car opened only last May and whisks passengers up to the top of 3,316ft (1,011m) Mt. Hoven in minutes. 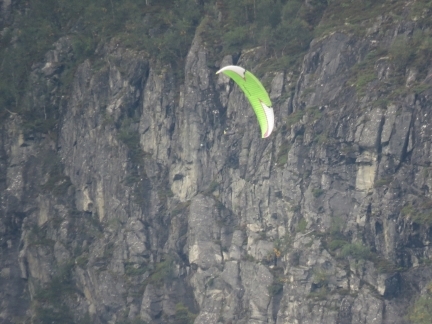 Paraglider flying down from the top of Mt. 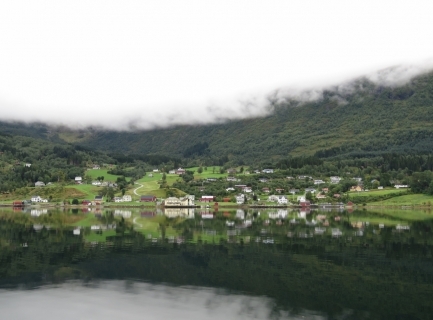 Hoven. We frequently saw them during our stay at Loen. 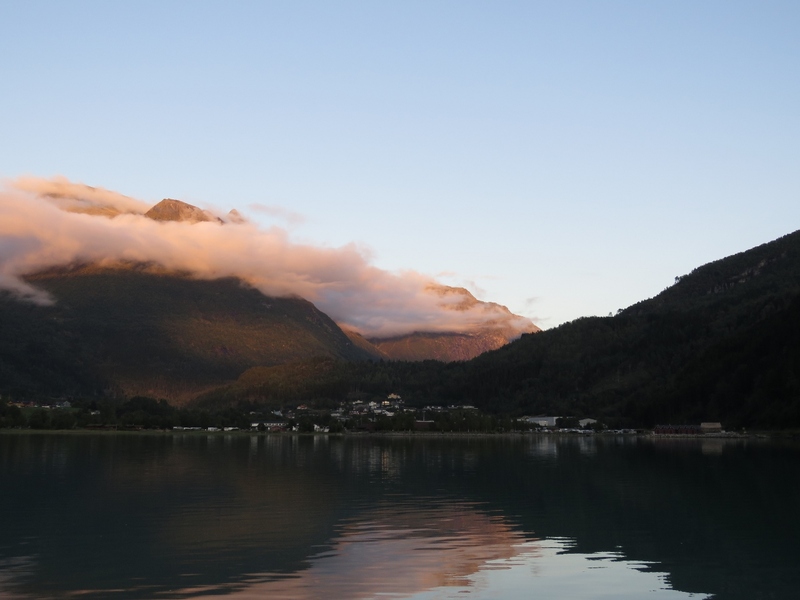 A beautiful dusk scene looking toward the Lodalen valley from the anchorage off Loen.